Dr Cornelius J. Casey was appointed the Director and then Associate Director of the Institute. His theological studies have taken him from Galway to Bangalore (India), to Rome and to Oxford. His initial Degree was in English literature and History at National University of Ireland, Galway (NUIG). He subsequently studied Philosophy and Theology in Bangalore, South India, for several years. During those years he developed a particular interest in the Tamil texts of the Srivaisnava Hindu tradition of the 12th - 14th centuries. He completed a Licentiate Degree in Theology from the University of Sant' Anselmo in Rome, with a specialised study of the Philosophy of Religion in the works of Ian Ramsey. He was awarded a D. Phil. in Oxford University under the supervision of the renowned Aquinas scholar Herbert McCabe OP. Dr Casey has lectured extensively in India, Ireland, the UK and the United States. From 1971 – 1975 he was Professor of Systematic Theology and Dean of Studies in St Alphonsus Seminary, Bangalore, South India, and during those years he was a frequent guest lecturer at the National Catechetical, Liturgical and Biblical Centre in Bangalore. In 1989–1990 he was a Research Fellow at the Institute for Ecumenical and Cultural Research, St John's University, Collegeville, Minnesota. 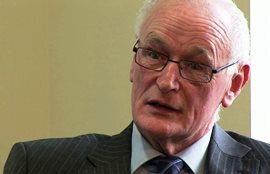 From 1996 – 1999 he was President of the Kimmage Mission Institute, Dublin, and from 2008-2010 he was President of the Milltown Institute of Philosophy and Theology in Dublin. Dr. Casey's research interests include the theology of Thomas Aquinas, (particularly contemporary analytic readings of Aquinas), current issues in Ecclesiology, and contemporary Hindu-Christian interchange. Associate Director of the Loyola Institute.